The move the City Council ensures that the city would be entitled to a portion of any settlement stemming from the legal action against the makers of prescription painkillers. The Portland City Council voted unanimously – and without discussion – Monday to join a nationwide lawsuit against opioid manufacturers. The move ensures that Maine’s largest city would be entitled to a portion of any potential financial settlement. The lawsuit also seeks to limit the availability of the drugs that often lead to addiction, according to Danielle West-Chuhta, the city’s top attorney. “The opioid epidemic has been and continues to be a crisis in the United States, in Maine, and more particularly in the City of Portland,” West-Chuhta said in a memo. “Governments in charge of caring for addicts with social services programs, homeless shelters, and police enforcement, among many other services, are now seeking to persuade the courts that the drug manufacturers bear some responsibility for these social costs and should help pay for them,” she said in the memo. For the second consecutive year, an average of one person a day is dying of an overdose in Maine. Last year, a record 376 Mainers died of drug overdoses, including 42 in Portland. That was a 40 percent increase statewide over the previous year. And Maine is on pace to see as many overdose deaths this year. In June, Maine Attorney General Janet Mills joined a multistate investigation into what role opioid manufacturers played in creating the current overdose epidemic. Mills did not specify which states were involved in the investigation and did not say whether the probe was criminal or civil in nature. An anecdotal spike in deaths over the summer caused public health officials in Portland to worry that drug dealers were lacing heroin with fentanyl or carfentanil, an elephant tranquilizer. 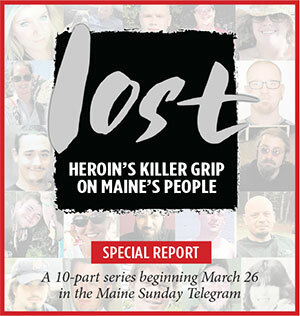 Last spring, the Press Herald published its “Lost” series, a 10-part series that looked at addiction and its victims. The resolution says that police officers, firefighters, emergency medical technicians and other city staff, including those working at the homeless shelter, respond to people struggling with addiction. The city is reallocating resources in an effort to combat the epidemic, the resolution states. West-Chutha said Monday the lawsuit will not cost the city any money.